I have to agree with my colleague Joe Calhoun. Everyone thinks the Fed is (over)reacting to the stock market drop in December. There’s a little bit of truth in it, reading so many FOMC transcripts as I have you get the unmistakable sense the S&P 500 is unofficially included on the policy dashboard. In the early part of 2007, policymakers certainly cared more about the NYSE than they paid attention to eurodollar futures. I doubt, I know they’ve learned nothing from the debacle. Still, what broke the stalemate wasn’t likely the DJIA. Powell was incredibly stubborn about wages and the strong economy until just recently, that’s true. Even a 20% share price correction doesn’t change his mind, though. It was instead inflation expectations, along with other market prices related to them (like swap spreads). …the extreme nature of the unemployment rate has finally forced Yellen’s hand. It really is a binary option at this point: admit the unemployment rate is faulty and open the can of worms about the last ten years, or keep the faith as she has done all along and bet it all on an imminent surge in something. Markets have already deserted the Fed. 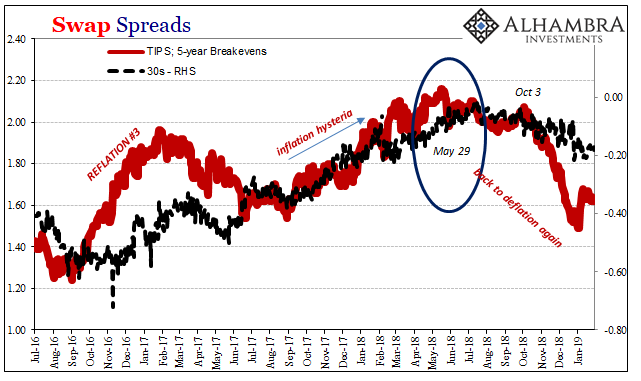 So long as inflation breakevens trended somewhat higher, backed by WTI, Fed officials like Yellen and Powell could keep up the pretense how the economy was moving along as they claimed. They could maintain the hope and expectation for that imminent surge. In fact, that’s what has spelled Powell’s entire tenure so far – proof for the unemployment rate is coming.